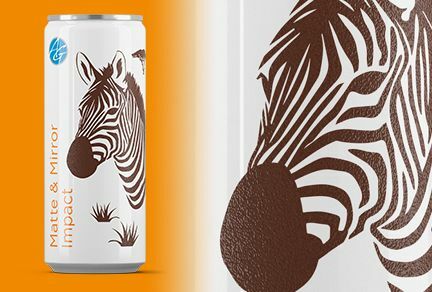 Ardagh Group said its latest beverage can finishing will integrate the trending combination of matte and glossy surfaces. The finishing, dubbed Matte & Mirror Impact, diversifies the company's finishings portfolio. The company claims that a new ink compound has been used in creating, what it calls an ‘eye-catching’ beverage packaging. The new packaging includes a special admixture which can be used on any printable colour and gives matte effect on otherwise glossy can surface. And, in the drying process of can production, the blend creates a surface structure that can reflect light differently, which produces a matte appearance. According to the company, the demand for matte packaging is increasing in the recent times, as several companies in the food and beverage industry seek this type of effect. It is easy to achieve this finish on paper or cardboard packaging, but for metal cans it has been very difficult to replicate and more difficult, especially to combine with the glossy elements. With latest can ink developments, the company claims that it was able to bring this much-sought after solution to its portfolio and to meet its customers demand in the particular product finish. Ardagh Group sales director Dirk Schwung said: “‘Matte & Mirror Impact’ provides an appealing design option, especially for brands who wants to create value through their packaging design. The new finishing helps customers to upgrade brand communication. According to the company, the can finishing will be available from next year. Image: Ardagh to introduce new can finishing at upcoming Drinktec in Munich Ardagh Group S.A.